As athletes kick up their exercise routines getting ready for endurance races being cycled or run in warmer weather need to be eating a diet that can help not only to perform well but to also recover quickly afterward. Peter Jaret shares five tips for athletes who are doing hard exercise for 90 or more minutes, especially if they’re including high intensity training that requires lots of endurance. While his guidelines may be well known to those who exercise on a regular basis, it’s always good to cover basics at the beginning of a season. It serves as a reminder of good habits for those who may be gearing up after a cold weather break as well as a good baseline for those who may be new to exercise and fitness. Here are his five guidelines. *”Carbohydrate loading for 3-4 days before an event can help top up your glycogen stores,” says sports dietitian Joy Dubost, PhD. 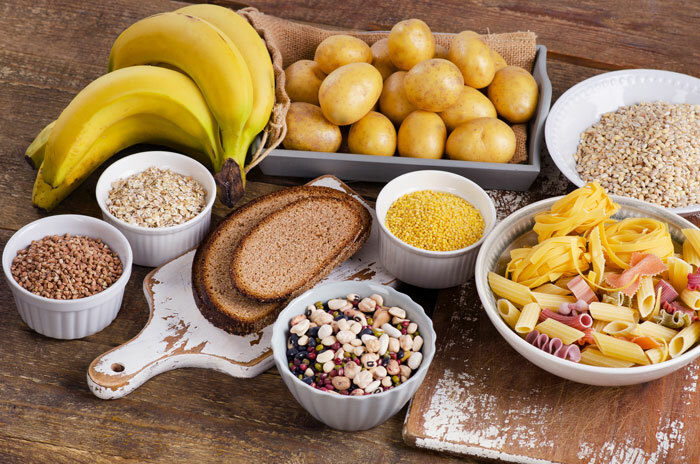 *Your diet should get about 70 percent of its calories from carbs that include breads, cereals, pasta, fruit and veggies to achieve maximum carbohydrate storage. *On the day of a big event you need to give your stomach time to empty. So plan to eat your last meal 3-4 hours before exercising. *To avoid dehydration, stay away from eating sugary or starchy foods within 30 minutes of starting any activity. *Replenish carbs, minerals and water during long exercise sessions by eating a snack and drinking fluid every 15-20 minutes. While many athletes prefer sports bars, sports drinks or gels for convenience, don’t forget that fruit and fruit juice are also excellent choices. *And after intensive exercise, reload on carbohydrates. Dubost suggests that post-exercise is the time for less refined carbs, like a whole-grain bagel or carrot sticks. Protein is what maintains your muscles but getting too much can put a strain on your kidneys. Choose lean meats, fish, poultry, nuts, beans, eggs or milk over protein supplements. Know how much protein you need so you won’t overdo. Jaret says the average person needs 1.2 to 1.4 grams of protein per kilogram of body weight a day, so a strength athlete may need up to 1.7 grams per kilogram of body weight. That works out to about 150 grams of protein for a 200-pound athlete. Milk, says Dubost, is one of the best post-event recovery foods because it provides a good balance of protein and carbs. In addition to calcium for strong bones, she mentions that milk also contains casein and whey protein, a combination that may be particularly helpful for athletes; whey is absorbed quickly and casein is digested more slowly, ensuring your long-term recovery. If you’re an endurance athlete, remember that when your carbohydrate stores run low, your body turns to fat for energy. Most athletes get all their required fat from following a good basic diet that includes mostly unsaturated fat from foods like nuts, avocados, olives, vegetable oils and fatty fish like salmon and tuna. But on the day of your event, avoid fatty foods since they can upset your stomach. Dehydration not only can hurt your performance, it can be life-threatening! Don’t wait until you’re thirsty to drink – by that time you may be seriously dehydrated, according to Debost who advises all high-intensity athletes to drink fluids early and often since intense exercise makes you lose fluid quickly. Jaret says endurance athletes like marathon runners or long-distance cyclists should drink 8-12 ounces of fluid every 10-15 minutes during an event. And when possible, drink chilled fluids which are more easily absorbed than those at room temperature and which also help cool down the body. Sweating not only removes fluids, it also removes electrolytes which help transmit nerve signals in your body. Sports drinks are good for replacing electrolytes. But if you’re losing a lot of fluid as you sweat, he recommends diluting sports drinks with equal amounts of water to restore a good balance of both.